Starting June 1st all medical patients nationwide will be required to have their individual Belize Health Information System (BHIS) cards to access health care services. Applications for the card can be done at any public medical facility with just an identification document, such as a Social Security Card or passport. The BHIS is considered a dynamic, comprehensive tool that will assist the Ministry of Health in providing better health care services in the fastest, most affordable and efficient way to Belizeans. The initiative is expected to benefit not only the nation’s hospitals, but other governmental health facilities. 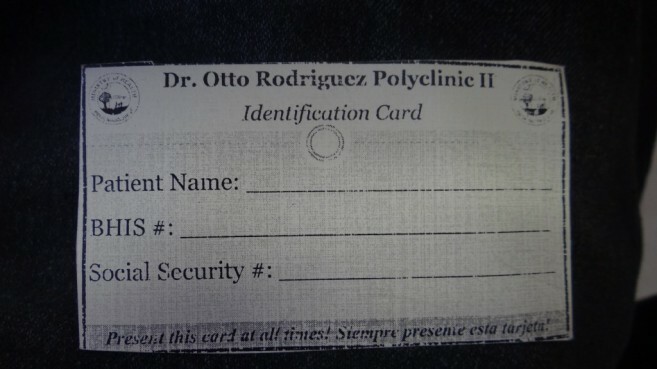 In San Pedro Town, all patients will be required to obtain this card in order to access health services, at the Dr. Otto Rodriguez San Pedro Polyclinic II. Services include outpatient, dental clinic, psychiatric clinic, gynaecology/obstetric clinic, pharmacy, lab, x-ray, and family community health, among others. According to Polyclinic personnel, the card’s purpose is to pass on information to the medical staff. The ID number on the card provides quick access to the medical history of the patient when treated at any public health care facility in the country. Other benefits include access to paperless prescriptions at pharmacies on the BHIS program upon presenting the card. The first card is completely free of charge. However, if lost, there will be a fee for its replacement. In San Pedro Town, registration began on Monday, May 15th and patients with pre-existing medical conditions are urged to visit the clinic to register for their cards. The service is also available for tourists and non-Belizeans. They will receive the same service, and even provided with a BHIS card in case they return. The polyclinic staff made clear that, in cases of emergencies, patients without a card will be offered immediate assistance. Patients will be registered once they are stabilized. To date, modules of the BHIS have been installed and are operating in 15 facilities around the country. The different modules include admission and discharge, clinician order, laboratory, supply chain management, pharmacy, HIV/AIDS, and human resources. The Ministry of Health asks the general public’s cooperation as they continue improving the health care system in Belize.